The 2019 Mountain Aire is fit with a cargo liner, 3/8” floor decking, 1 1/4” bead foam, and galvanized sheeting to prevent distortion. Lengths, heights, widths, and dry weights are approximate. Weight will vary based on optional equipment added to the base weights listed below. Specifications are supplied by each chassis manufacturer. In addition, Mountain Aire is supported by our ultra-durable STAR Foundation for a quieter ride. A 500-horsepower Cummins® diesel engine and Comfort Drive™ adaptive steering with Passive Steer technology comes standard. 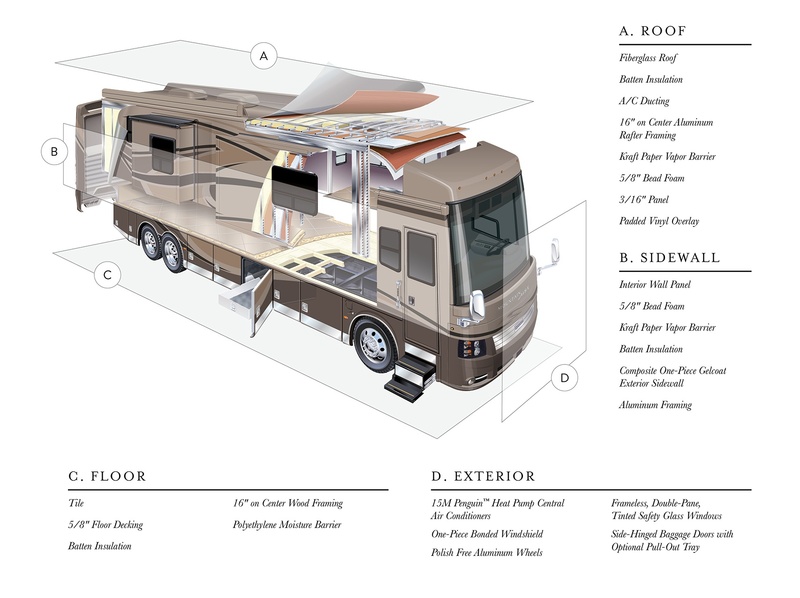 Like a fine home, the 2019 Mountain Aire is framed 16 inches on center and is covered by a fiberglass roof with walkable decking and an integrated gutter rail. Click or tap for more details. 4018 Cummins ISX 500 1645 11.9 Liters 4.3 150 gal. Allison 4000MH 6 15 246+TAG Michelin 15000 7500 1500 55 8 20000 lb. 20000 lb. 14000 lb. 54000 lb. 69000 lb. 42900 lb. 11100 lb. 4533 Cummins ISX 500 1645 11.9 Liters 4.3 150 gal. Allison 4000MH 6 15 294+TAG Michelin 15000 15000 1500 52 12 20000 lb. 20000 lb. 14000 lb. 54000 lb. 69000 lb. 45100 lb. 8900 lb. 4534 Cummins ISX 500 1645 11.9 Liters 4.3 150 gal. Allison 4000MH 6 15 294+TAG Michelin 15000 7500 1500 55 8 20000 lb. 20000 lb. 14000 lb. 54000 lb. 69000 lb. 44800 lb. 9200 lb. 4535 Cummins ISX 500 1645 11.9 Liters 4.3 150 gal. Allison 4000MH 6 15 294+TAG Michelin 15000 7500 1500 55 8 20000 lb. 20000 lb. 14000 lb. 54000 lb. 69000 lb. 44800 lb. 9200 lb. 4543 Cummins ISX 500 1645 11.9 Liters 4.3 150 gal. Allison 4000MH 6 15 294+TAG Michelin 15000 7500 1500 55 8 20000 lb. 20000 lb. 14000 lb. 54000 lb. 69000 lb. 44600 lb. 9400 lb. 4550 Cummins ISX 500 1645 11.9 Liters 4.3 150 gal. Allison 4000MH 6 15 294+TAG Michelin 15000 7500 1500 55 8 20000 lb. 20000 lb. 14000 lb. 54000 lb. 69000 lb. 44200 lb. 9800 lb. 4551 Cummins ISX 500 1645 11.9 Liters 4.3 150 gal. Allison 4000MH 6 15 294+TAG Michelin 15000 7500 1500 55 8 20000 lb. 20000 lb. 14000 lb. 54000 lb. 69000 lb. 44500 lb. 9500 lb. 4576 Cummins ISX 500 1645 11.9 Liters 4.3 150 gal. Allison 4000MH 6 15 294+TAG Michelin 15000 7500 1500 55 8 20000 lb. 20000 lb. 14000 lb. 54000 lb. 69000 lb. 44200 lb. 9800 lb. 4579 Cummins ISX 500 1645 11.9 Liters 4.3 150 gal. Allison 4000MH 6 15 294+TAG Michelin 15000 7500 1500 55 8 20000 lb. 20000 lb. 14000 lb. 54000 lb. 69000 lb. 44500 lb. 9500 lb. 4533 Cummins ISX 500 1645 11.9 Liters 4.3 150 gal. Allison 4000MH 6 15 294+TAG Michelin 15000 15000 1500 52 12 20000 lb. 20000 lb. 14000 lb. 54000 lb. 69000 lb. 44600 lb. 9400 lb. 4534 Cummins ISX 500 1645 11.9 Liters 4.3 150 gal. Allison 4000MH 6 15 294+TAG Michelin 15000 15000 1500 52 12 20000 lb. 20000 lb. 14000 lb. 54000 lb. 69000 lb. 45000 lb. 9000 lb. 4535 Cummins ISX 500 1645 11.9 Liters 4.3 150 gal. Allison 4000MH 6 15 294+TAG Michelin 15000 15000 1500 52 12 20000 lb. 20000 lb. 14000 lb. 54000 lb. 69000 lb. 45100 lb. 8900 lb. 4543 Cummins ISX 500 1645 11.9 Liters 4.3 150 gal. Allison 4000MH 6 15 294+TAG Michelin 15000 15000 1500 52 12 20000 lb. 20000 lb. 14000 lb. 54000 lb. 69000 lb. 44900 lb. 9100 lb. 4550 Cummins ISX 500 1645 11.9 Liters 4.3 150 gal. Allison 4000MH 6 15 294+TAG Michelin 15000 15000 1500 52 12 20000 lb. 20000 lb. 14000 lb. 54000 lb. 69000 lb. 44400 lb. 9600 lb. 4551 Cummins ISX 500 1645 11.9 Liters 4.3 150 gal. Allison 4000MH 6 15 294+TAG Michelin 15000 15000 1500 52 12 20000 lb. 20000 lb. 14000 lb. 54000 lb. 69000 lb. 44900 lb. 9100 lb. 4576 Cummins ISX 500 1645 11.9 Liters 4.3 150 gal. Allison 4000MH 6 15 294+TAG Michelin 15000 15000 1500 52 12 20000 lb. 20000 lb. 14000 lb. 54000 lb. 69000 lb. 44400 lb. 9600 lb. 4579 Cummins ISX 500 1645 11.9 Liters 4.3 150 gal. Allison 4000MH 6 15 294+TAG Michelin 15000 15000 1500 52 12 20000 lb. 20000 lb. 14000 lb. 54000 lb. 69000 lb. 44900 lb. 9100 lb.